There are 9 steps to building a custom home. He outline each in detail below, so you know what to expect at each stage of the build. The Mix. Ordering the correct concrete mix is a critical ingredient to a perfect slab. Factors that must be considered include the soil content, the slope on the lot, the weather on the day of the pour, the home to be built on the lot, and much more. Knowing how to order the correct concrete mix comes with years of experience and many pours. Since Shan started his career in commercial construction, he has overseen over 100,000 cubic yards of concrete pours. Couple that with his Construction Science degree from Texas A&M, which included courses on concrete design, soil dynamics, material methods, structural design and analysis, and it ensures that we select the appropriate concrete for each project. The Pump. A concrete pump ensures a uniform pour, adequate finishing time, fewer voids, and a uniform finish due to the speed of the application. It is Jenkins Custom Homes policy to employ a concrete pump, or two if required, on every project. It is simply foolish take a chance that concrete will get old waiting for the trucks ahead of it, when for a marginal additional cost, a concrete pump will ensure that the end result is a stronger slab and a smoother finish. The Tape Measure. Have you ever seen a house under construction where the slab has been jack hammered in spots? This is caused by the lack of a tape measure, an inability to read plans, or both. When different subcontractors work on a slab, it’s common for miscommunication to occur and mistakes to be made. It’s our policy to personally measure all the forms, electrical and plumbing penetrations after all the subcontractors have left and just before we schedule the concrete for the pour. It’s such a simple concept, but surprising how few builders institute and enforce this policy. It’s this type of attention to detail that makes all the difference in the quality of a home. Although we have employed methods such as concrete block for certain applications, we typically “stick-build” our homes. 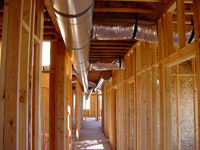 This means we use conventional framing techniques, while following or exceeding the International Residential Building Codes. We also use solid wood for our materials; we never use finger joint studs. In addition, we check every stick of lumber for mold and structural integrity before it is used in a home. 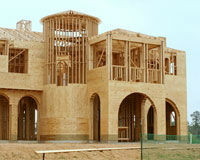 We will not use molded, warped, or utility grade structural lumber in our homes. To ensure every framing detail follows local and national codes (and they are always changing), we also employ a third party inspector to inspect our framing. Just like every other major phase of construction on our homes, third party inspections are important to our peace of mind, and yours. Mold can, of course, only grow in areas where moisture is present, and can grow with even a small plumbing leak. To ensure there are no leaks in the plumbing, we put water in the pipes of our homes, with the appropriate amount of pressure, for several weeks before sheet rock. During this time, we visually inspect every joint for even the tiniest leak. By the time sheet rock goes up, any problem will have been identified and repaired. The best way to keep problems from occurring even before this stage, however, is to pour a perfect slab so that all the plumbing penetrations hit the walls perfectly. Your HVAC system is a critical component to preventing mold while preserving indoor air quality. A proper system will push the air through your home, replacing the moist outside air with drier “conditioned” air. One of the downsides of the new tight, energy-efficient methods that are employed in home building is a propensity for mold to develop. At Jenkins Custom Homes we build a tight, energy-efficient home with methods that will not develop mold problems over time. We have been building mold-free homes since 1992, and we are continually educating ourselves about new techniques and installation methods. The NAHB (National Association of Home Builders) and other building science researchers have studied and provided us with valuable training and data in this area. As members of the NAHB, the Texas Association of Builders, and the Greater Austin Home Builders Association, we stay current on their findings. The final component that must be installed at this phase of construction is electrical and low voltage wiring. Every single electrical plug, ethernet drop, and cable outlet must have the appropriate wiring before the home gets insulation and sheet rock. 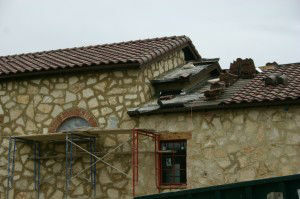 Roof leaks can be the worst nightmare for any builder or homeowner. They are often hard to find and hard to fix. Especially around the fireplace, a leak can occur very easily. However, they are often so tiny that they go unnoticed by a builder. That is why we water-test certain areas of the roof. Usually, we will have a rain before the sheet rock goes up (nature’s water test). After a good rain, our builders will carefully inspect the home for leaks. However, around the fireplace we will often hire a waterproofing company to do a 2-hour test just to make certain there are no leaks, not even tiny ones. We do this because even a tiny leak will result in moisture behind the walls. And, of course, mold can grow anywhere moisture is present. Insulation has come a long way over just the past 10 years. With the emergence of new techniques, such as Cell Foam insulation and Blown-in Batts (BIBS), homes can be better insulated and benefit from the longevity of products that simply stand up better over time. Some products are chosen for their “green” features, such as blue jean insulation (recycled blue jeans that have been formulated into insulation). Others are superior in performance. Depending on the insulation method chosen, there are now sheet rock products which can better sound insulate than ever before. Once the home is insulated, sheet rock can then be applied throughout. Finally, tape and texture is applied to conceal the sheet rock joints. Different textures can be applied to achieve different looks. The old stand-by “orange peel” is seldom used in our homes except in closets. Our homes typically get a smoother hand trowel texture in all public areas and may sometimes require an artisan to achieve a specific look. Next, the cabinets and trim are installed. The cabinets are typically built off-site at a small local cabinet shop and brought in for installation. Then, trim can be installed right up to the cabinets. Trim includes the base board, door and window trim, and any other specialty trim. Finally, the paint and stain is applied throughout the home. At this point, we like to say that the “bling” or “beauty items” are brought in to be applied to the home. Once we begin to see countertops, tile, appliances, plumbing fixtures, and light fixtures, the house begins to take on its own unique style. Depending on whether the flooring is wood, tile, or some other material, the flooring will have a specific spot in the overall schedule. Wood must be applied toward the very end, whereas concrete floors are basically “installed” when the slab is poured. Hardware, such as door and cabinet hardware, is the final “jewelry” along with the glass and mirrors. Specialty glass may make it into the schedule at an earlier point, but typical glass for showers and cabinet doors typically get installed toward the end of the project. Because a construction project by design requires some tough products, the final clean tends to happen over the course of the last several months. As one clean is completed, it’s as if another layer of dirt and dust are revealed for the next round of cleaning. As a result, our final clean is really a series of cleaning days over a period of months, designed to get to the home truly clean and ready for move-in. In fact, there are a lot of little steps along the way (like the daily cleans that are required by all of our trade partners on site) that work to mitigate and help make this step happen more smoothly. The final step, which needs no explanation, is move-in!